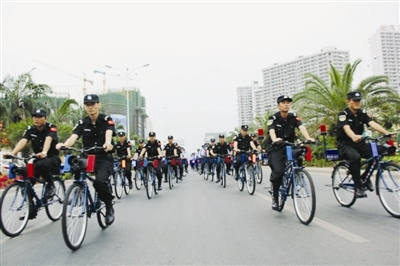 On the morning of 24th March, 100 solar-powered police bicycles started patrolling on Sanya streets. These 100 solar-powered police bicycles were donated by the Hainan Provincial Science and Technology Department and Yingli Green Energy Holding Company Limited, and also designed by Yingli Green Energy Holding Company Limited. The electric power generated by the bicycles can be used for alerter and night illumination. Using police bicycles is a significant measure for Sanya police to improve patrol efficiency and increase the patrol’s coverage, which can help frighten criminals and enhance the awareness of security among the public, said Jiangwei, the director of the Public Security Bureau. The team which consisted of 100 solar energy bicycles started from the office building of Sanya Public Security Bureau, along Phoenix Road, Jingji Ling road and Hedong Road for a cruise. It presented Sanya police’s new image to the public.